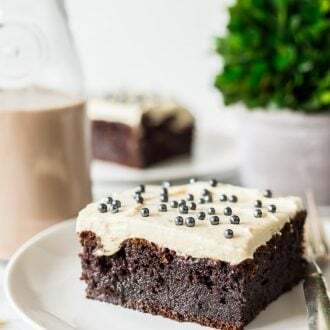 Chocolate Irish Cream Cake is made with a generous dose of Irish cream and topped with a fluffy, pudding-based frosting. This grown-up dessert is moist, rich, and oh-so-boozy! 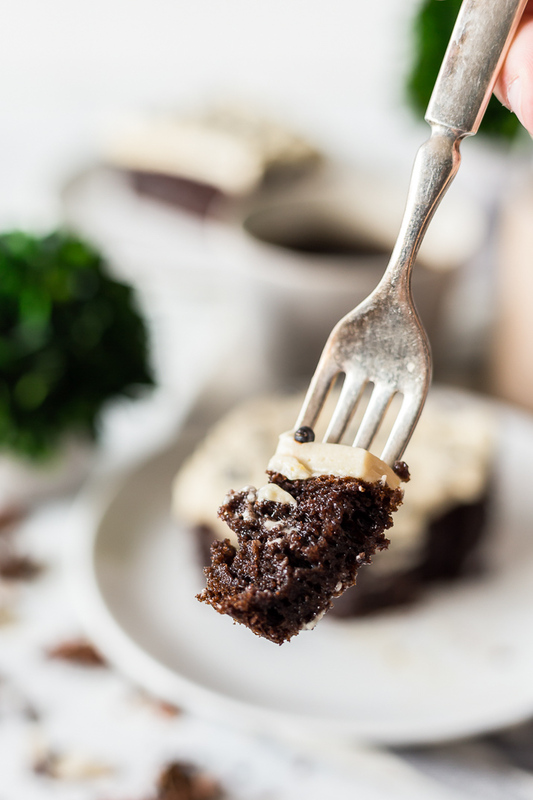 Chocolate Irish Cream Cake is not the type of chocolate cake that’s served at children’s birthday parties, folks! 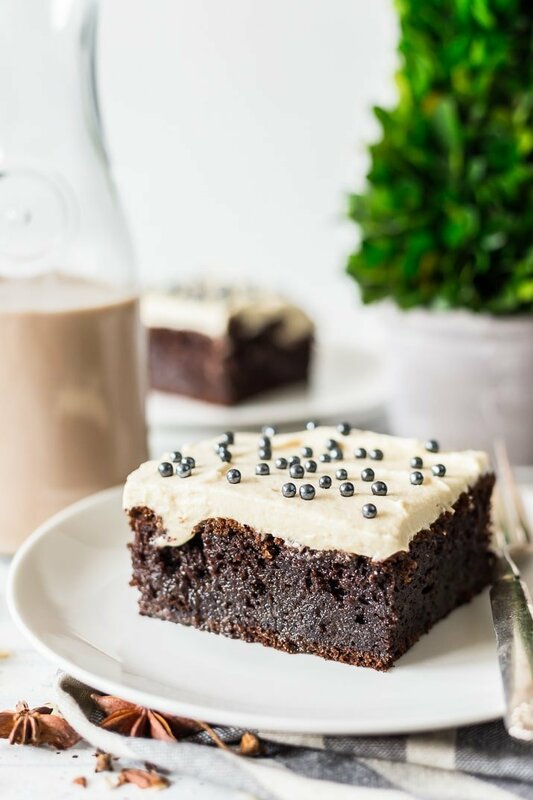 Saint Patrick’s day will be here before you know it, and if you can’t resist chocolate and boozy cocktails, you’ll get the best of both worlds with this decadent Irish Cream Cake. 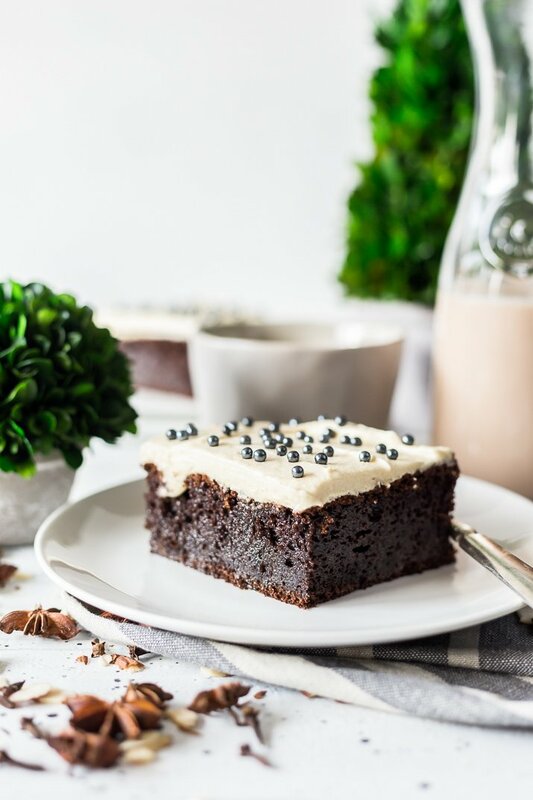 The indulgent dessert consists of rich cake and fluffy frosting that’s infused with Homemade Irish Cream, and a piece of it will definitely get you buzzing! Needless to say, it’s definitely an adults-only type of cake; don’t let the kiddos get into this one! 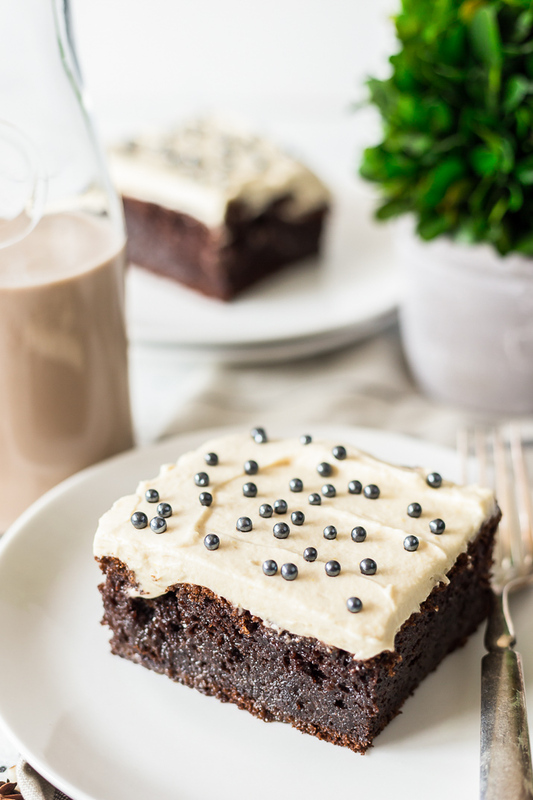 Irish Cream Chocolate Cake is BOOZY! This Irish Cream Cake recipe is a poke cake and calls for ½ cup of booze right in the batter. Once the sheet cake is baked, holes are poked in it so that a mixture of sweetened condensed milk and (more!) Irish cream can sink in and get absorbed throughout the whole thing. Then there’s the frosting, made smooth and silky with a blend of heavy cream, powdered sugar, vanilla pudding mix, and — you guessed it —more Irish cream! Yep, there’s plenty of the good stuff in here! Have you ever had a tough time deciding whether you should mix up a cocktail or go straight for the chocolate? With Irish Cream Cake, you can do both at once, multitasking at its finest if I do say so myself! 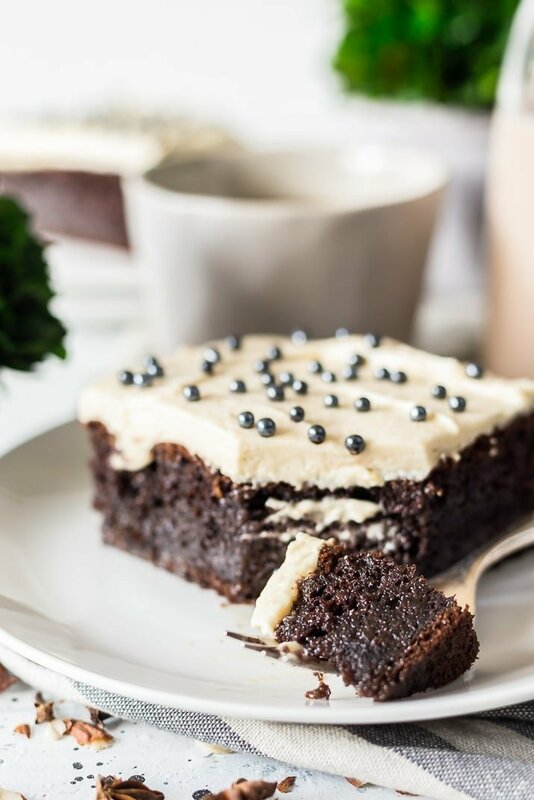 Whether you’re planning a Saint Patrick’s Day bash or a simple dinner with your better half, nothing says, “Let’s celebrate!” like a spiked chocolate cake. This cake recipe is perfect for just about any special occasion. I even brought a similar recipe to our family’s last 4th of July barbecue last year, and it was a huge hit. If you want to feel “the luck of the Irish,” try baking a moist, rich Irish Cream Cake that’s drenched in boozy goodness. Whether you share it at a party or savor a piece after a long day at work, you won’t regret indulging in this chocolatey treat! Spray a 9 x 13-inch baking pan with cooking spray and set aside. In a large bowl or stand mixer, combined all of the cake ingredients until fully mixed and pour into the prepared pan. Bake for 30 to 40 minutes or until toothpick comes clean from center of the cake. Remove from oven and allow to cool completely. In a medium bowl, combine the Irish Cream and sweetened condensed milk until combined. Used the hand of a wooden spoon or chopsticks, poke holes all over the cake. Buy the cheap irish cream. No need for top shelf. How do you make home made Irish Cream can I have the recipe ? Can substitute something to get the flavor of Irish creme, that doesn’t contain alcohol? What could I use, non alcoholic. Hi Melissa, You can use Bailey’s Irish Creamers that you find with the refrigerated coffee creamers. These are non-alcoholic and have a similar delicious taste! Thank you. Would I use the same about of it as the recipe calls for the Irish Creme alcohol? For the frosting, does the 1/3 c of pudding mean prepared pudding or 1/3 C of pudding mix? is 1/3 cup the ammount in a 3.4 oz pkg of pudding?? Hi Jenny, no, 3.4 oz is more than 1/3 cup. If not consuming immediately, yes, it should be stored in the fridge for freshness. My cake collapsed in the middle? It appears done could it just be the chocolate chips that is making it so moist? Hi Michelle, the cake will be moist, especially after you add the pour-over mixture. It shouldn’t be collapsed in the middle, this usually happens if you open the door too early in the baking process, cake mix was old, or it wasn’t cooked long enough. My cake collapsed in the middle. I did not underbake it and I purposely did not open the door until the end of the baking time.It looks like brownies now. I poured the sauce over the top and most of it just sits there even after I poked holes all over the cake. I hope the frosting hides everything and it tastes ok.
Is this cake really 600 thousand calories?? Hi Jane, each slice of cake is 600 calories, as we think of calories. I think you are reading the kcal as 1000 calories, which is technically accurate, the k is actually for kilocalories. A single actual calorie is a super small unit of energy and what we think of as a calorie actually has 1000 calories in it. So when we talk about a 2000 daily calorie allowance, we are technically talking about 2,000,000 calories and 2000 kilocalories. So yes, technically the cake has 600,000 calories per slice, but it has 600 kilocalories per slice and that’s what we use for diet measurements. In the video, heavy cream is used. It’s not listed I. The written recipe. How much heavy cream do I use if I’m just using Bailey’s Irish Cream? If I make this ahead of time, say I need to serve it tomorrow night, should I make the cake portion now and pour on the condensed milk mixture and frost tomorrow? Or??? What would you suggest? Hi Mary, that would be my suggestion since the frosting is best fresh, but if you are short on time tomorrow, you can frost it tonight and keep it in the fridge and you should be good to go! Enjoy! Yes, the cake will still be delicious! Hi! This sounds delicious! Couple of questions: Can I sub butter for the oil and am I supposed to cool the cake completely before pouring the liquid in? I just ask because a lot of the poke cakes I make I pour it when it’s still a little warm so I just wanted to double check! Thanks!! Hi Jessie, I have never made this with butter so I really can’t speak to how it would turn out. You can pour the liquid mixture over the cake while it’s warm or after it has cooled. I made this cake for a community dinner tonight. I wanted to take a photo of the cake but it was all gone! Everyone loved it!! I used a GF chocolate cake mix. I live at 5600 feet so added one more egg, cooked at 375 and it took almost 40-45 minutes to bake. It was the only GF desert there and six people asked me for the recipe. It was so good and I am almost sorry there were no left overs! How long do you have to mix the frosting ingredients together? Mine is not becoming light and fluffy it is still liquid. I’m not sure what went wrong. Suggestions or help? Hi Katie, it can take several minutes, especially with a hand mixer. As long as you are using heavy/whipping cream, it will fluff up. Does this cake need to be refrigerated after being made? Made this for my community St. Patrick’s Day Pot Luck….WOW ! EVERYONE loved it – said it should be what I bring to every pot luck. That was yesterday….today while out walking friends are stopping me to say how delicious the cake was. Thank you for a great recipe ! Yay, so glad everyone loved it! in the poke holes the night before and refrigerate the cake? Hi Carole, yes I would frost as close to serving as possible but do the pour the day you make the cake.